Sandhya Menon's debut, When Dimple Met Rishi, was a book I loved with every fiber of my being last year. I couldn't wait to get my hands on From Twinkle, With Love. The minute I had the book in my hands, I jumped to read it. As with When Dimple Met Rishi, this book epitomized everything I adore in a feel-good rom-com, that was also a story about growing up. The star of this book is without a doubt Twinkle. She is not a straightforward character and I absolutely loved that about her. Most of you guys know how much of a sucker I am for flawed characters, especially flawed teen characters. 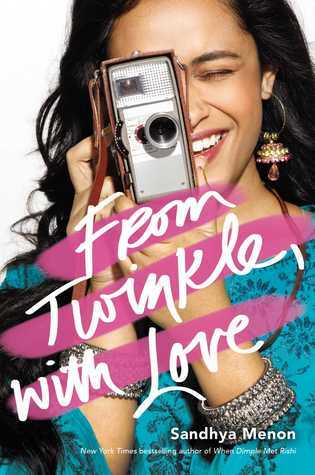 Twinkle was the perfect example of the kind of imperfect characters I love in my books. She screws up a lot during the course of the book, but she learns from her mistakes and rises up much stronger than she was at the beginning. You get to see so many facets of her personality. There was her goal-oriented, talented, big-hearted side, and on the opposite end, there was her angry side which we get to see frequently. I loved every part of her complex personality. I also adored how she found comfort in writing letters to her favorite female filmmakers. I found that to be a charming and compelling aspect of From Twinkle, With Love. If you enjoyed When Dimple Met Rishi, you will have no trouble falling for Twinkle, Sahil and the wonderful cast of characters. I can't wait for more Sandhya Menon books in my life! Who are some of your favorite female filmmakers?